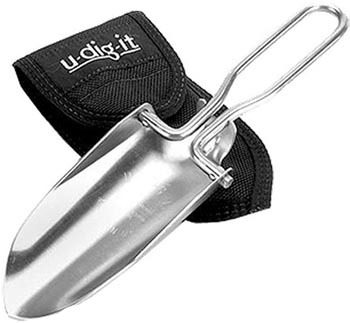 U-Dig-It Folding Hand Shovel - Measures 9 1/8" overall opened and 5 3/4" closed. All unbendable, rust-proof stainless construction. Can be opened with one hand and the folding handle snaps into place with one easy gesture. Complies with "Leave No Trace" ethic. Fits into U.S. Army Cold/Hot Climate Aircraft Survival Kits. Can be used for burying human or pet waste, clearing rocks and debris, plant removal, digging pits or trenches for campfires, cleaning and scaling fish, reflective signaling, cooking utensil (can be heated) and trail maintenance (i.e. filling holes, diverting washouts). Used by the US Forest Service. Black ballistic nylon belt sheath. Weight: 6 oz.